“Don’t focus on the skinny black line” was the trademark admonition of former National Hurricane Center (NHC) director Max Mayfield dating back to the 1990s. It’s advice that media and residents of southwest Florida would have done well to heed when Hurricane Charley crossed Cuba in August 2004. Too much attention was paid to a track forecast depicting landfall near Tampa, and too few appreciated that Port Charlotte, only 70 miles to the south, was also under a hurricane warning. Although tropical cyclone forecasts had improved dramatically over the years, they were still far from perfect, as residents of Port Charlotte would soon find out. 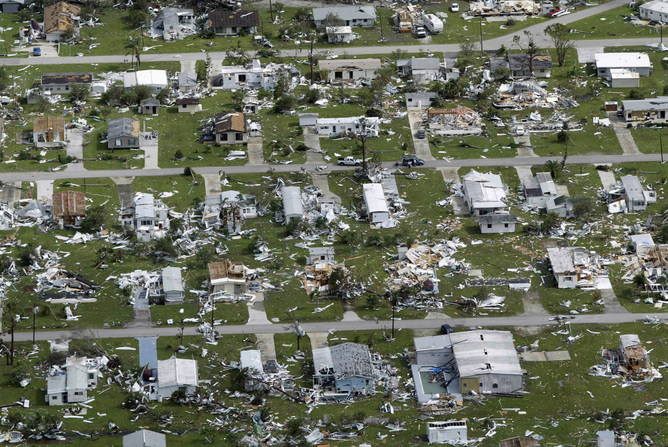 Damage near Port Charlotte in the wake of 2004’s Hurricane Charley. Is the storm headed for me? Highly visible successes, such as the dead-on track forecasts for 2003’s Hurricane Isabel, might have contributed to complacency ahead of Charley’s landfall the following year. And as it happens, tropical cyclone motion is a well-understood and relatively simple physical process: Storms are steered by the large-scale atmospheric currents that surround them. For the past quarter-century, computer models have, for the most part, been able to effectively forecast a hurricane’s track. Using global measurements from a wide array of sensors, they take an estimate of the current state of the atmosphere and use certain physical laws to calculate forward in time to obtain the future position of the hurricane. Track forecasts have steadily improved as ever-increasing quantity and accuracy of atmospheric observations enable us to input more accurate initial conditions, and faster computers allow our numerical models to replicate the increasingly fine detail those observations provide. This progress can be readily seen in the evolution of NHC’s “cone of uncertainty,” which is formed from circles that are expected to enclose the actual position of the storm two-thirds of the time. By this measure, the uncertainty in a hurricane’s track has decreased by nearly 40% over the decade since deadly Hurricane Katrina. The cone has gotten smaller as our forecast accuracy has improved. While we at the NHC are pleased to see this improvement, of course, we continue to worry that highly successful track forecasts with recent storms such as Irene, Sandy and even 2015’s Ana may lead users to have developed unrealistic expectations. But how bad will it be? Forecasting hurricane intensity (the highest one-minute average wind associated with the storm), on the other hand, has proven to be more difficult. Readers likely have seen and remember numerous examples of forecast failures. The physics are far more complicated, involving features and processes on the smaller scale of miles or tens of miles, rather than the hundred- or thousand-mile-wide features that govern track. In the early 1990s, numerical models that successfully forecast track were still hopelessly too coarse for intensity prediction. And there were nowhere near enough observations in and around the hurricane eyewall to get these models off to a good start, even if they had had sufficient resolution. With little objective guidance, forecasters got by on a combination of instinct and experience, until statistical models were developed that looked at how past storms in similar circumstances behaved. But even the statistical models were not as good as an experienced forecaster. It’s not surprising, then, that NHC’s official intensity errors were basically unchanged – locked in around 15 knots above or below the actual wind speeds for the average two-day error – through the decades of the ‘90s and the ’00s. 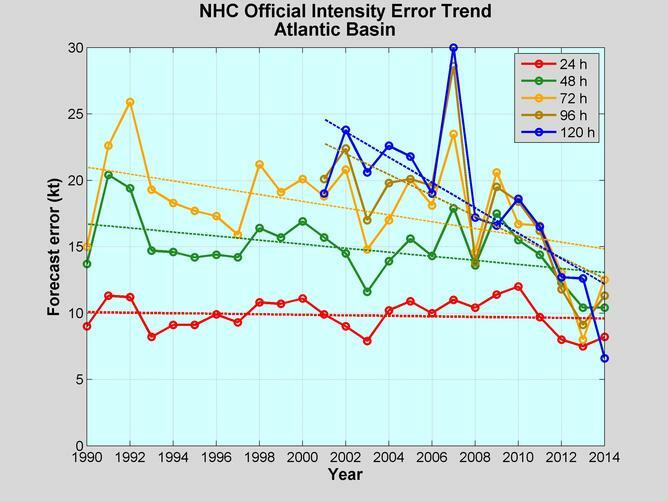 The intensity forecast trend is going in the right direction… but can still use some improvement. 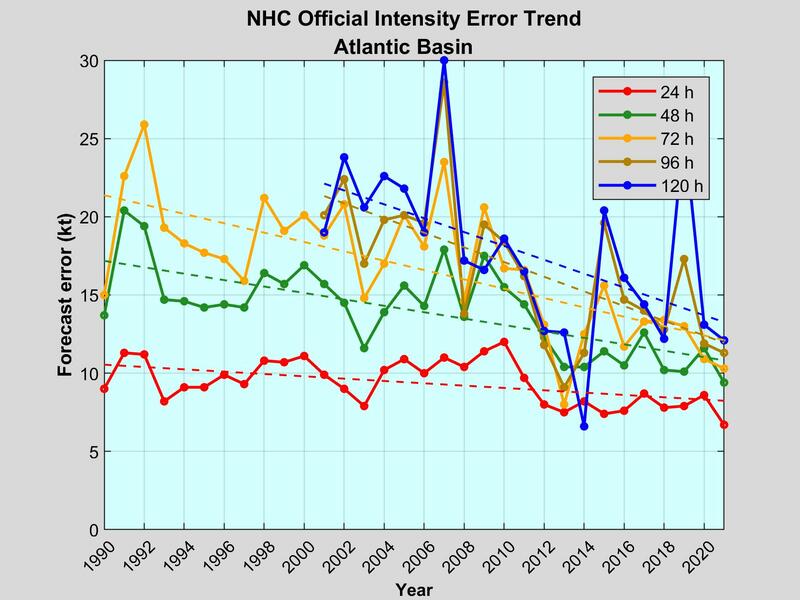 The past few seasons, however, have seen a dramatic lowering of intensity forecast errors, particularly at two days out and longer. To some extent this has simply been good luck – strong wind shear and dry, sinking air have dominated the Atlantic basin in recent seasons and limited the numbers of strong and rapidly strengthening storms – and when storms stay weak, forecast errors tend to be low. But NOAA’s Hurricane Forecast Improvement Project (HFIP), a 10-year program now halfway completed, also deserves a share of the credit. HFIP has supported substantial investments in research, modeling and the development of tools for forecasters, all tightly focused on improving the objective guidance available to the National Hurricane Center. The National Weather Service’s regional hurricane model, known as HWRF, has been a particular target for HFIP-supported improvements. With increased resolution (the ability to “see” smaller and smaller atmospheric features), more accurate algorithms for estimating energy exchanges with the ocean and the handling of clouds, and more sophisticated ways of ingesting data from a hurricane’s inner core, the HWRF model has become skilled enough even to beat the NHC human forecasters in some retrospective tests. While it will likely require an active Atlantic hurricane season to truly assess how much progress we’ve made, we’re starting to see real advances. Unfortunately, HFIP funding was cut by more than half this year, putting future advances at risk. Hurricane Irene headed from the Bahamas to North Carolina in 2011. Nearly 20 years later, even as the science has progressed, Max Mayfield’s advice is still sound – don’t focus on the skinny black line! Forecasts are uncertain, and an appreciation of that uncertainty is essential to smart decision-making when hurricanes threaten. To help educate users, NHC has established a web page dedicated to forecast accuracy. Please drop by and have a look to see how well our forecasts measure up. And finally, even though NOAA and others are expecting a relatively quiet 2015 Atlantic hurricane season, remember: it takes only one bad storm in your neighborhood to make it a bad year for you. James Franklin is Branch Chief Hurricane Specialist Unit at the National Hurricane Center at National Oceanic and Atmospheric Administration.